Wind Chimes – Work In Progress. . .
Here’s a snippet of a new thing I’ve been working on – I thought I’d show a ‘WIP’ version as the completed item is turning out to be incredibly time consuming for some reason! I really like wind chimes, and I’m always ‘magpie-like’ collecting lots of bits and pieces that make tinkly noises when hung up and hit! Old keys have always been good for this purpose, and I’ve finally started assembling some recent acquisitions into workable pieces. I’ve got enough to make three complete chimes at the mo, so I thought it might be novel to combine them into some sort of stand/artwork which would allow me to both display them attractively and also be taken away and recorded for use in my music projects. I’ve just finished the second one (made from yale-type door keys) and now starting on the third. Once that’s completed and I know final dimensions etc I’ll start on the the stand. I’ll then post a picture up, and hopefully some sound files also! 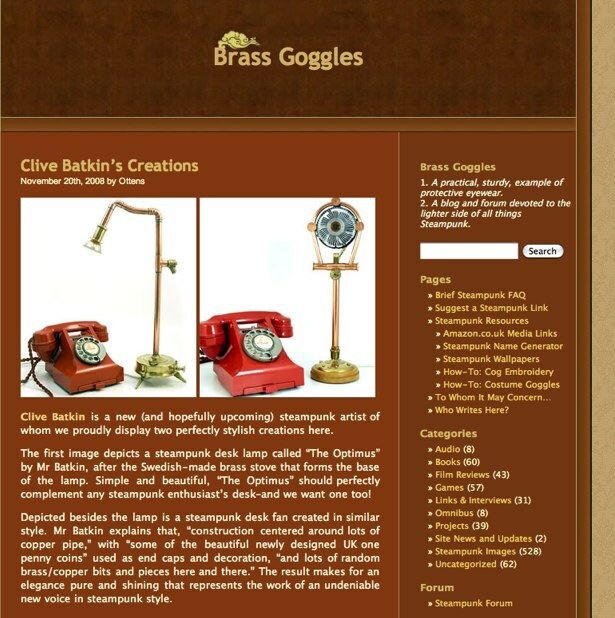 I was really pleased to get another great review of my steampunk stuff this week, this time from premier Steampunk site Brass Goggles. Echoing the sentiments of The Gateway site coverage earlier in the week, BG gave me a bit of a longer review and some thumbnail photos. I’m over the moon about it, as to get positive feedback from such a well known and respected site in the field is a real boost! Many thanks!! Another review of the ol’ CD. . . I sent a copy of the ‘G Force Trousers’ CD to a guy called Jim in Canada a little while ago, in response to my blog posting re the free cds. I’ve been used to hearing Canadian Folk and bluegrass, and American Folk and bluegrass, from around the early 70s on. It’s interesting to try and figure out the influences of an artist, and I’m usually in the ballpark, but I have come up against a brick wall when it comes to what you’re doing. It would seem that you are a chameleon of sorts, adapting to the influences around you as you play with different artists. I consider it amazing, and it seems like only those who play by ear can rise to this level of talent. I really enjoyed the music, although I believe with some North American production, your sound might just be a bit deeper and more robust, if you know what I mean. Folk is relatively gentle, but North American folk and bluegrass artists have been recording for a long time, and the studios have kind of perfected a rich tone in the recording of these artists. That said, it was a pleasure to listen to, and I could literally taste the music, which I immensely enjoyed. Keep up the great work, and maybe if you get a chance, listen to some Les Paul, and Chet Atkins’ early stuff, you’ll see what I mean about being able to taste the music. Thanks again for that little serving of British Folk. I’ve still got a couple left by the way, so if anyone is interested in a copy just let me know. . .
An old friend of mine – Sue Reeve – started a ‘life style management’ company (Consider It Done) a couple of years ago, and I’m glad to say it’s going from strength to strength. The business has just been featured in this week’s Sunday Times ‘Style‘ magazine supplement, and I thought I’d stick a PDF of it up for all to see. Now, if only I can get her to sort my life out. . .? An undeniable new voice in steampunk style! I’ve just seen that my ‘Optimus‘ lamp got a really nice write up on The Gatehouse steampunk blog (it was about the forth feature down at the time of writing), so many thanks for that people and for your excellent site!! The phrase: ‘the work of an undeniable new voice in steampunk style’ was even mentioned… ooh!! I also had a very nice email communication with Tomasz, the proprietor of the fantastic Steampunk Pics blog… There are some great images on there that he has collected from all sorts of sources, so definitely check that one out if you are interested in the whole SP genré. I’ve always wanted to see my name up in, er, wood. 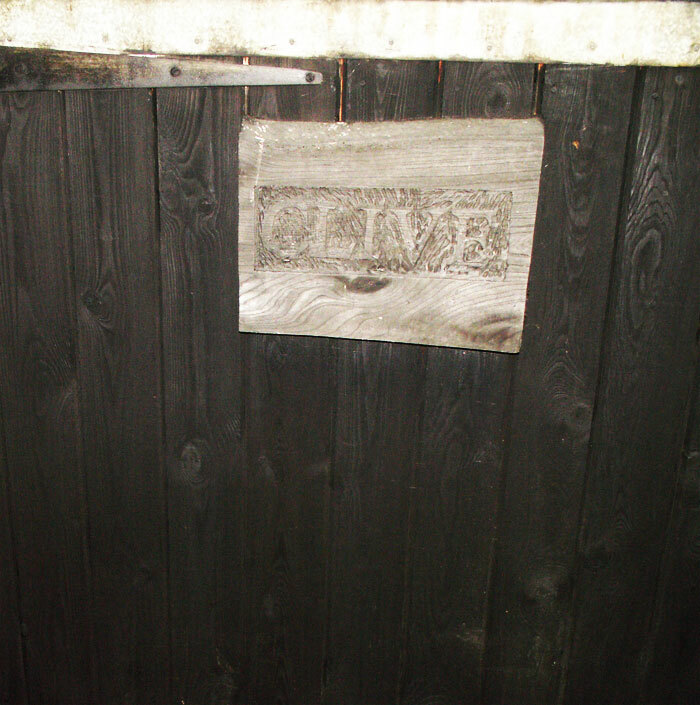 . .
One of the bands I play with once in a while (Navaro) rehearse in a set of practice studios built from disused stableblocks in the grounds of a farm. It’s a very rural location, rather out of the way but a nice place to practice on warm summer nights (although a bit nippy in the winter months it has to be said!). Whilst loading my gear into our designated practice room this evening, I was amazed to see the following carved wooden name plate, still attached to the outside of the room’s door. Presumably the name of the horse that once resided there, I found it a surprising yet pleasant coincidence that I was was playing in a room with my name on it! The photo above is a bit fuzzy (I’m not the greatest photographer at the best of times and it was a particularly dark and wet night when I took this shot) but still. . . fame at last?